Did you guess last week’s Mystery Creature? It is such a master of camouflage that it was difficult to even see it in the picture but it was the very awesome Orchid Mantis (Hymenopus coronatus). 1. Orchid Mantises are native to the rainforests of south east Asia… the word mantis comes from Greek word “mantikos” meaning “soothsayer” or “prophet”. 2. 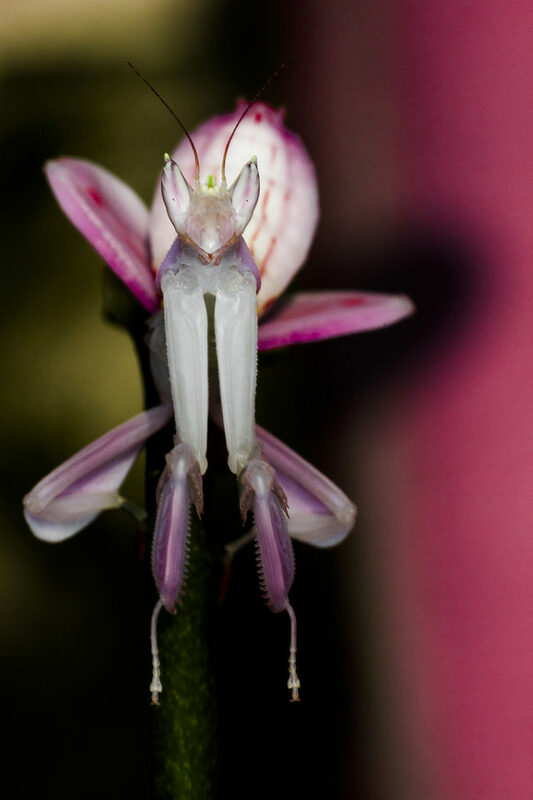 The Orchid Mantis gets its name from its amazing ability to mimic an orchid flower, with the abdomen and four walking legs appearing as the body and petals of the flower. The insect may be white, pink or purple with a range of colour combinations. 3. What is truly remarkable about the Orchid Mantis is that it appears to exhibit “aggressive mimickry”. According to a 2013 study carried out on Malasyian Orchid Mantis it is not mearly hiding among orchids and using them to lure in its prey but they are the lure themselves. The Orchid Mantis appears to other insects as an actual native flower, so much so that the insect is attracted to it, and once it comes within reach it becomes dinner! So effective is the Orchid Mantis at this that these initial studies reported it to lure 30% more insects to it than the actual plant itself. 4. Orchid Mantises, along with other Mantids, share a common ancestor with termites and cockroaches. 6. Orchid mantids are sexually dismorhpic, the females can grow to double the size of the male (about 6cm). The male matures more quickly, taking five to six months to reach full maturity, compared with the females eight months. 8. The nymphs when hatched, look more like ants (with black and orange/red bodies) but lose these colours as they grow and molt. It is thought that the newly hatched nymphs have this colouration to mimic aggressive or foul tasting insects. 9. Orchid Mantises eat a large variety of flies and pollinating insects such as bees, butterflies and moths. They may also eat small lizards and bananas. They are preyed upon by lizards, toads, certain jumping spiders and bats. 10. As with many other species of Mantises, the Orchid Mantis has spiked forlegs that they use to hold their prey securely in place while they eat.